I guess it was only a matter of time. Someone has taken Twitter’s Bootstrap CSS project and re-skinned it to look a bit more like Facebook. FBootstrap, as it is called, should be very useful for those who make Facebook applications and enhancements for fan pages. 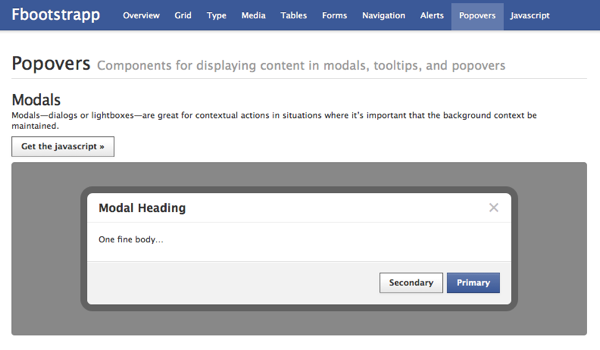 In addition to meshing well with Facebook’s design, the grid CSS has been tweaked to match the widths of fan page tabs (520px) and application canvases (760px). Many of the elements don’t look quite like Facebook’s, especially the form fields, but they’re close enough that the average user won’t notice. The modal boxes have one of the closest adaptations.